Reading food labels and understanding nutritional information is important to following a healthy eating plan. Whether you wish to lose weight, gain weight or control a health condition with diet, the food label is your guide to success. Food manufacturers list ingredients, serving size, amount of servings per package, calories, fats, and other information that will allow you to make an informed choice about the foods you eat. Nutritional labels list ingredients in order of quantities the food contains. For example, a loaf of wheat bread will most likely list Wheat flour as its first ingredient. This is because the ingredient present in the largest quantity in the bread is wheat flour. Other ingredients will be listed in descending order. It is important to read the ingredients on food labels, even though many of the items listed are impossible to pronounce. A long list of ingredients usually means that the food contains a large amount of chemical additives. Some food labels are geared more towards selling the food to the consumer rather than informing them. Read wording carefully. Watch out for "buzz" words and phrases. Just because a food does not contain chemicals or preservatives does not mean that it is not high in harmful processed fats or high in sugar. For more indepth information about reading food labels, you may want to read the e-book Healthy Eating for Busy People Who Don't Have Time For It. Knowing what amount of food constitutes one serving helps in monitoring your daily caloric intake. Eating over sized portions is a major factor in weight gain. Serving size information helps accurately measure the amount of food you eat. There are good carbohydrates and bad carbohydrates. Good carbs should be a part of a healthy diet. Healthy carbohydrates come from starchy foods such as beans, rice, cereal, potatoes, and pasta. Avoid added sugars like high fructose corn syrup, or foods containing additives that end in "ose" such as dextrose, sucrose, and maltose. These are simple sugars that are not easily used by the body. It is most commonly recommended that people over the age of two keep their overall dietary fat intake to 30 percent, with only 10 percent being from saturated fats. 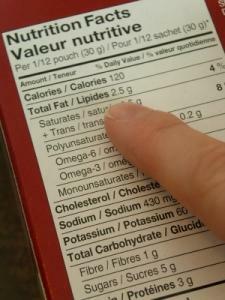 Food labels will allow you to determine which foods are low in fat. Polyunsaturated fat- This is a good fat that the body can use. It is found in nuts and fish. Monounstaurated fat-These fats are known to lower harmful LDL cholesterol and can be found in foods such as olive oil, oatmeal, and avocados. Saturated fat-Found most often in animal fats, this type of fat is to be limited. Trans fats-Processed fats that are unhealthy, and can contribute to heart disease. A diet high in fiber is important for proper digestive functions and weight control. The average woman under 50 years old needs about 25 grams of fiber each day, and men of the same age should have around 38 grams of fiber daily. Reading the nutritional information regarding fiber will allow you to select foods that are healthy and high in fiber. Food labels contain additional nutritional information, like daily values of cholesterol, protein, vitamins and minerals, and sodium. This information is the best way to determine that your nutritional intake is what is best for you and your individual health circumstances. Understanding how the Percent Daily Value works will help you make an informed and accurate determination about the nutritional value of a food. The condensed explanation of the percent daily value is that it is based on a diet that contains 2,000 calories per day. The percentage will be adjusted up or down based on an increase or decrease of daily calories. A basic rule for following this guide is that a food containing less than 5% of a particular nutrient would be considered low. A high percentage for a nutrient would be 20 percent. Reading food labels can take a little time, but good health is worth the effort. With a little research and a few extra minutes at the store, you can literally improve the quality of your life by making informed food choices.